Maha-Vishnu is the first of the Purushas (“controllers,” also known as Vishnus), incarnations of Krishna for the creation of the material universe. Maha-Vishnu creates innumerable universes. He lies down in the Causal Ocean on the bed of Ananta Shesha and initiates the creation by glancing at His personified material energy, Maya. 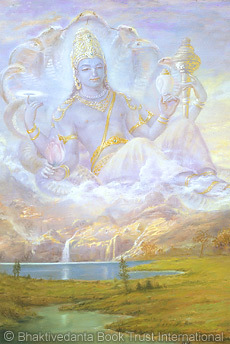 From Maha-Vishnu come the other two Vishnus: Garbhodakashayi Vishnu and Kshirodakashayi Vishnu. Maha-Vishnu creates the innumerable universes: Garbhodakashayi Vishnu enters into each individual universe to oversee it; and Ksirodakashayi Vishnu enters into each atom in every universe and sits with us souls in our hearts as Supersoul.